Has your garden area seen better days? Do you not have a proper outside space and you need the advice of accredited local experts? 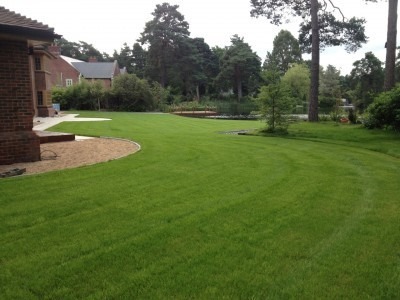 For innovative garden services in Ringwood that are competitively priced, look no further than Abbey Turf. Get a free quote right away by calling our friendly team of professionals on 02380 812 302. You can be confident that you are dealing with the best of the best when you choose Abbey Turf. There is no job that is too small, too large or too complicated for us to take on and effectively complete. Keep reading to find out more about what makes us number one for garden services in Ringwood. Have you been dreaming of having a garden area that you can relax in and show off to your visitors? We are here to help you make your dreams a reality with our garden services in Ringwood. With more than two decades of hands-on experience to draw from, we will be your one-stop shop for landscaping. Our team has the vision to invigorate the beauty of your outdoor space in ways you never thought possible before. We can treat you to an ocean of colour with a garden that will act as your perfect private haven as well as an area for entertaining guests. From patios and paving to new walls and bespoke garden ornaments, we can do it all. We always source the best materials available for our hard landscaping solutions. Whether your property lacks a proper garden area or you feel like your existing ones could use some unique features, you have come to the right place. We will know exactly how to start and take you from the initial concept to the final handover. Whatever it is that you seek, we aim to accommodate you with our unique designs that exude imagination and creativity. From garden walls to brick barbecues to full-sized summer houses, the sky really is the limit with our garden construction services. Do you know exactly what you want to achieve and have a very specific design in mind? Are you at a loss for ideas and need the assistance of friendly landscaping professionals? Abbey Turf can help. Not only are all of our garden services in Ringwood creative, but they are also offered at very affordable prices that won’t break the bank. All projects are always finished within the pre-agreed budget and on time with no exceptions. Our gallery has a great selection of high-resolution images from successful past projects. Take some time to browse through this part of our website and see the work of our gardeners in Ringwood for yourself. Get in touch with us today by filling in our contact form, calling 02380 812 302 or e-mailing info@abbeyturf.co.uk to find out more about what we can do for you. We’ll listen to your ideas and give you a quote for our garden services in Ringwood with no strings attached.